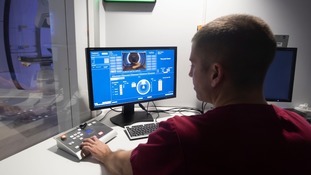 Radiographer David Kirk demonstrates the control room at the NHS's new Proton Beam therapy centre Photo: Press Association. The Christie in Manchester currently has two treatment rooms able to accept patients, while a third will be up and running in the next few months. The centre hopes to treat up to 750 patients every year. Dr Ed Smith, clinical director of proton therapy at the Christie NHS Foundation Trust, said the UK centres represent an exciting development. Until now, British patients have had to go overseas for treatment, to countries including the US. Dr Smith said: "Many patients have been abroad for proton therapy and it's been admired internationally that we've been able to send patients abroad in a timely way. "But the ability for patients to access treatment in the UK removes a huge burden in that they do not have to travel abroad, and do not have to leave home or leave jobs. "Some patients haven't been able to travel abroad because they are too ill, or their treatment need is so urgent that they have had to undergo radiation here and haven't been able to access proton beam therapy abroad." He said that, as more evidence is gathered on its effectiveness, there was a view that more and more patients will benefit from proton beam therapy. Alongside running clinical trials, one room at the Christie has also been set aside for research into protons themselves. He said: "I think the NHS will be a leader in proton research, both technical and clinical." Dr Smith said proton beam therapy improved patient well-being, reducing the effects of radiation such as damage to surrounding tissues. "For example, if you're treating a brain tumour, you can treat the tumour and spare a lot of normal brain tissue," he said. This is important for protecting brain function, including thing such as IQ and memory. Traditional radiotherapy also increases the risk of secondary cancers developing - a risk that is reduced with proton beam therapy. Dr Smith said: "Radiation damages DNA and sometimes it does not get healed properly and so you can end up with mutations." He said two groups of patients particularly benefit from proton beam therapy - young people who still have developing tissue and older patients whose tumours are close to critical structures such as the brain stem or spinal cord. He said this latter group can sometimes not be cured by regular radiotherapy because of where their tumours sit. But proton beam therapy offers the opportunity to deliver "a curative dose". However, he said not all patients undergoing treatment will live longer. Some will not be cured but will benefit from fewer side-effects and will be less likely to lose function. He said: "For some patients who might not have increased survival, you can avoid significant impact on things like cognitive ability and mobility loss." He added: "At the moment, the majority of patients we are treating are children and young adults, but we are treating adults as well. "When we are at full capacity, about 40% to 50% of our capacity will be directed towards those patients who will benefit from proton beam therapy over X-rays. "The other 50% to 60% of our patients will be on clinical trials." He said these clinical trials could look at the effect of proton beam therapy on cancers such as pancreatic cancer, some head and neck cancers and some patients with breast tumours.